Some people like to Netflix and chill, Osmose prefers to "Cook & Chill". From a classically trained selector we'd expect nothing less... "Get It Straight" is the spicy starter, steamed with big soul emotion and orchestration and very familiar voices. "Disco Pagen Fantasy" is a meaty main course. Unhurried and hearty, the flavours really kick in as the swooning strings mark the development of the loop-heavy downbeat groove. Finally for pudding we're sent to bed satisfied and satiated with a lovingly languished citrus slo-mo jam. Delicious. A2. King Most "Fiesta Forever (Osmose Mix)"
B1. The Silver Rider "Luv Ur Lyfe"
Since first appearing back in 2011, DJ Osmose's Smokecloud Records has developed into one of the more reliable sources of pitched down, dubbed-out disco reworks. The label's Bedroom Disco series - so called, we suspect, because the edits tend towards the seductive and sensual - launched in 2014, and here returns for the first time since. 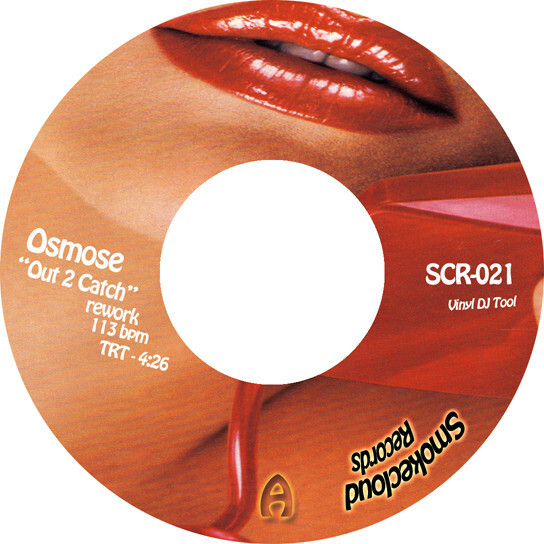 There's much to admire, from the beatdown disco shuffle of Osmose's "Solid Game" and the rubbery, slo-mo disco-funk shuffle of The Silver Rider's hypnotic "Luv Ur Lyfe", and Osmose's delay and filter heavy AOR disco re-shape, "Stone Dance". Best of all, though, is Osmose's remix of King Most's "Fiesta Forever", a deliciously Balearic, glassy-eyed re-imagining of Lionel Richie's "All Night Long". A1. The Silver Rider "I Wanna Be"
Smokecloud Records has long claimed to be the World's only imprint dedicated to Detroit Beatdown style reworks of funk, soul, disco and boogie gems. Whether this is true or not, there's no denying the consistent quality of the imprint's output. This latest release features contributions from two label stalwarts; owner and A&R man Osmose, and New Yorker The Silver Rider. The latter kicks things off with "I Wanna Be", a rolling, soft touch head-nodder that fuses elements of a tactile soul cut with hypnotic, pitched-down house beats and filter sweeps. It's rather good, but nowhere near as inspired as Osmose's "Trust", which turns a classic Motor City soul cut into a smooth, toe-tapping Beatdown shuffler.